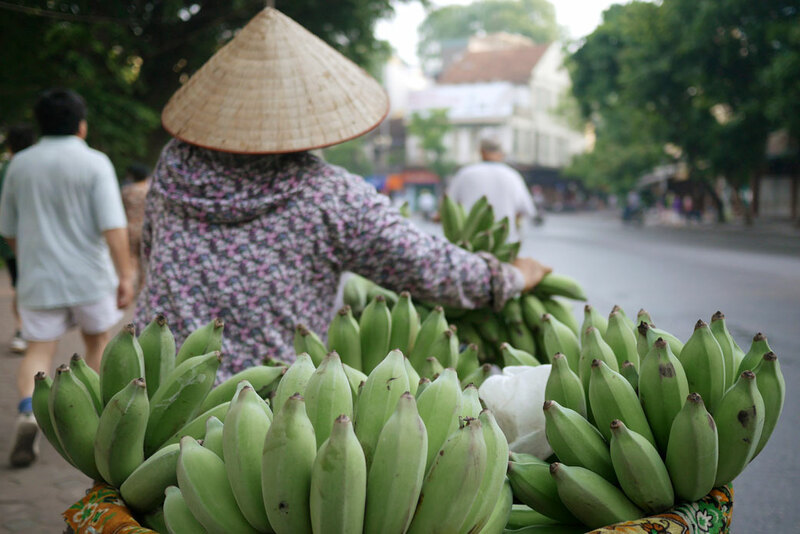 A woman sells bananas from her moving bicycle on a waterfront road along Hoan Kiem Lake in Hanoi, Vietnam, June 2015. The United States and China should look beyond their differences and work with Southeast Asian nations on shared challenges. The Center for American Progress and the China Institutes of Contemporary International Relations, or CICIR, have partnered often over the years, working regularly on areas of cooperation between China and the United States and on options for managing areas of competition and tension. Together, CAP and CICIR have held or participated in many conferences, workshops, and symposiums that bring together Chinese and U.S. officials and scholars; we have worked on joint publications; and we believe that we have helped enable substantial cooperation between the United States and China. Mistrust complicates U.S.-China relations and can obscure areas where cooperation might be possible and beneficial. Negative dynamics also obscure from others the depth of U.S.-China cooperation in a wide range of areas. In this report, we try to cut through these dynamics and offer new options. In 2014, CAP and CICIR began to discuss how U.S.-China tensions might be obscuring areas of mutual interest in Southeast Asia, a region of tremendous importance strategically and economically to the entire region and the world. Prior to this project, in our respective organizations, the people who work on Southeast Asia did not work closely with colleagues working on U.S.-China bilateral relations. In most cases, our bilateral experts had spent little or no time in Southeast Asia, yet the tensions at play in the region featured prominently in their day-to-day work. Both the United States and China, meanwhile, were making investments and building new partnerships with Southeast Asian countries. Was Southeast Asia to be an arena of competition for China and the United States, or could there be areas of cooperation with members of the Association of Southeast Asian Nations, or ASEAN, that brought benefit to all? The potential for research by our teams with Southeast Asian counterparts was clear. It was our friend and colleague Nina Hachigian who proposed the concept that would make this a groundbreaking project. Now the U.S. ambassador to ASEAN, Hachigian is a diplomat and scholar of rare skill and creativity. She noted that CAP and CICIR could only do productive work in this area by doing two things: First, the organizations needed to join their stovepiped research teams into a single group with expertise on both Southeast Asia and U.S.-China relations. Second, CAP and CICIR had to partner with scholars in the region who study the United States, China, and ASEAN. And rather than holding a conference, why not travel through the region with local hosts? Traveling together and having our research teams hosted by talented and dedicated partners in six Southeast Asian nations was a revelation. In each country, we not only identified possible areas of cooperation and discussed in-depth persistent tensions and concerns, but our teams also deepened their understanding of one another and of this region. We also discovered that we each had our own deep but parallel networks in Southeast Asia, and we established professional and personal connections across these networks. We were not limited to conference rooms, as we also visited markets and great historic sites. We enjoyed the food and culture of the nations that we visited, and we met with the people making Southeast Asia one of the most dynamic regions on earth. From a policy standpoint, this project was able to surface several areas of potential cooperation and confidence building that would be welcomed by nations in the region and make sense for the United States and China. It also built relationships among people who will be working on these issues for many years to come. We cannot give enough thanks to our partners in Southeast Asia. The Centre for Strategic and International Studies in Indonesia; the Institute of Strategic and International Studies in Malaysia; the Strategic Studies Center in Thailand; the Institute of Strategic and International Studies and Myanmar Development Resource Institute in Myanmar; the Diplomatic Academy of Vietnam; and the S. Rajaratnam School of International Studies in Singapore all brought a stunning array of scholars and officials to the workshops they hosted for us. We are grateful for the hospitality, the professional insights, and the challenging discussions and brainstorming sessions these organizations made possible. We are also thankful to each of our ambassadors in every country we visited and to the many officials and members of civil society who took the time to meet with us. Finally, Helena Kolenda and Li Ling at The Henry Luce Foundation made this work possible. From the beginning, they recognized the value of taking this new approach, helped us shape the program, and gave us ideas along the way. They encouraged us to focus not only on the substance but also on the relationships among our team members and our partners in the region, as well as to value the intellectual, cultural, and personal exchange and policy innovation. We believe we were successful in these aims, and we found this collaborative research process among the most gratifying of our professional experiences. From January 2015 to October 2016, CAP and the China Institutes of Contemporary International Relations joined forces to conduct field research across six nations in Southeast Asia: Indonesia; Malaysia; Thailand; Myanmar; Vietnam; and Singapore. The thought going into this first-of-its-kind joint effort was that there were many underexplored opportunities for U.S.-China collaboration in the region. The aim was to test that assumption and find out what types of new initiatives the region would welcome. CAP and CICIR also wanted to learn more about how regional experts viewed the U.S.-China relationship. Toward that end, three questions were posed in each nation visited: (1) What do Southeast Asian nations want from a U.S.-China relationship in their region? (2) What are the opportunities for U.S.-China cooperation in the region that the two nations are not currently pursuing? and (3) How do the United States and China need to adjust strategy to make pursuing those opportunities possible? Southeast Asian countries welcome U.S.-China cooperation on challenges facing Southeast Asia and seek stable U.S.-China relations. The experts with whom the research team met highly value their relationships with both the United States and China and worry about what they view as an escalating U.S.-China rivalry in the region. Southeast Asian countries expect the United States and China to respect the centrality of the Association of Southeast Asian Nations if the United States and China cooperate in Southeast Asia. Opinions varied by country regarding whether U.S.-China cooperation would be desirable with a particular third country or whether such cooperation should be done with ASEAN as a whole. ASEAN countries have clarity on what China is bringing to the table but less clarity on the future U.S. role. Many Southeast Asian leaders view economic development as their top priority and view the United States as being more engaged on security issues than economic issues; for that reason, the research team heard many questions about whether the United States was truly focused on the region’s needs. ASEAN countries would like the United States and China to resuscitate moribund ASEAN initiatives and expand existing areas of positive U.S.-China cooperation into multilateral initiatives in which Southeast Asia can also engage. Southeast Asian experts interviewed were particularly interested in learning about how the United States and China are working bilaterally on global climate change, ocean issues, and people-to-people exchanges. Interlocutors also often expressed interest in the United States and China cooperating in regional multilateral forums, such as the ASEAN Regional Forum; the East Asia Summit; and the ASEAN Defense Ministers’ Meeting Plus, among others. Expand U.S.-China ocean cooperation to include coastal nations and coastal cities in Southeast Asia. Expand U.S.-China energy and climate cooperation to include Southeast Asian nations. Support sustainable infrastructure development in Southeast Asian nations. Expand bilateral people-to-people cooperation to be trilateral. Deepen U.S.-China cooperation on Southeast Asia connectivity and consider embarking on a landmark infrastructure project. Develop a trilateral Track 2, or unofficial track, process, and leverage trilateral cooperation within existing official ASEAN institutions at the Track 1 level, or official track. The United States and China should find specific initiatives to cooperate on within the ASEAN institutions. The U.S.-China relationship is a lynchpin for global economic prosperity and global security. On problems ranging from global financial stability to cybersecurity to climate change, when the United States and China cooperate, they become the poles around which the rest of the global community can rally. At the bilateral level, U.S.-China cooperation is even more important for the nations’ respective domestic interests. Our economies have become so intertwined that small actions on one side of the Pacific can have big impacts on the other. Leaders in both nations recognize that on many policy issues, bilateral collaboration is the best way forward, and when it works, the benefits can be astronomical. Yet despite the many reasons to cooperate, in recent years, disagreements, suspicions, and strategic rivalry have dominated the agenda. Our interdependence is a double-edged sword. Because our political and economic systems are so different, diverging interests are inevitable on at least some issues, and because we are so important to one another, both sides tend to view differences in approach or opinion as strategic threats. Although the U.S.-China relationship has grown steadily closer over the past three decades, we still have not managed to overcome a troubling and persistent dynamic: When tensions flare, conflicts quickly begin to dominate the overall bilateral relationship, and that makes it difficult to focus attention on areas of common interest. Furthermore, there are substantial numbers of influential U.S. opinion-makers who view China’s rise with suspicion and think a powerful China is likely to flex its muscles and seek to create a regional order that adversely affects U.S. interests. Likewise, a great many influential Chinese scholars and policymakers believe that the United States is intent on undermining China’s development and seeks to encircle a rising China with alliances and military bases. Southeast Asia’s economic importance to both Washington and Beijing should create great opportunities for cooperative U.S.-China engagement in the region. At present, however, when U.S. and Chinese leaders discuss Southeast Asia, those discussions are more likely to focus on concerns about each other’s actions in the region’s maritime territorial disputes rather than areas of common interest. To be sure, regarding the South China Sea and other security issues, there are serious disagreements between Washington and Beijing. That fact cannot be disputed, and the South China Sea problem is one that both nations—and the region as a whole—must work to address. The broader problem, however, is that when officials in Washington and Beijing view U.S.-China interactions in the region through a competitive lens, that obscures opportunities for collaboration that could benefit the two countries and the entire region. Recognizing this point, CAP and CICIR engaged in a joint research project to unearth areas where cooperation could be possible. This report outlines the scope of that project, findings based on field research, and recommendations for U.S. and Chinese policymakers. U.S.-China cooperation in Southeast Asia has been a blind spot in U.S.-China relations. In both Washington and Beijing, U.S.-China policy is generally formulated by one group of experts, and Southeast Asia policy is formulated by another. These divides inside the expert communities make it difficult to formulate ideas for a Southeast Asia policy agenda that is integrated with U.S.-China policy. Policy discussions that bring together all relevant parties from the U.S. side, the Chinese side, and third-party Southeast Asian nations do not exist. Unfortunately, this means that all parties are often surprised to find that their policy approaches are not well-received by counterparts around or across the Pacific. Tensions begin to escalate, and cooperation appears increasingly elusive. In an effort to break down those walls, CAP and the China Institutes of Contemporary International Relations joined forces to jointly explore—bilaterally and with Southeast Asian nations—how the United States and China can better work together in this important region. CAP and CICIR conducted joint field research in Southeast Asia to hear directly from Southeast Asian nations what they want from U.S.-China cooperation in the region. The bilateral U.S.-China research team then worked collaboratively to reflect on what it heard in the region, to determine what new opportunities may exist for cooperation, and to identify a set of policy tools that leaders in both nations can use to take advantage of those opportunities. This type of joint effort is something that has never been done before. Normally, at best, American scholars visit China and Southeast Asia separately and, once safely ensconced back in the United States, decide themselves how U.S. policymakers should approach broad regional issues. The same dynamic applies in China, and it is not productive. CAP and CICIR believe that a more collaborative research model is necessary. In August 2015 and May 2016, the CAP-CICIR research team engaged in extensive joint field research, visiting Indonesia, Malaysia, Thailand, Myanmar, Vietnam, and Singapore. In each country, the joint research team was co-led by CICIR Vice President Yuan Peng and CAP Vice President for National Security and International Policy Vikram Singh. CICIR Deputy Director of the Institute for South Asian, Southeast Asian and Oceania Studies Zhang Xuegang; CICIR Deputy Director of the Institute of American Studies Chen Wenxin; CAP Director for East and Southeast Asia Brian Harding; and CAP Senior Fellow and Director of China Policy Melanie Hart also participated in all stops. CICIR researchers Zhang Fan, Luo Yongkun, and Yang Wenjing; CAP researchers Blaine Johnson and Shiva Polefka; and former CAP researcher Aarthi Gunasekaran joined for portions. The research team selected these six countries to visit—three of which are located in Mainland Southeast Asia and three of which are located in Maritime Southeast Asia—due to their strategic importance and their likely interest in facilitating U.S.-China cooperation in the region. In each country, CAP and CICIR partnered with leading think tanks to convene trilateral workshops. Those local partners included: the Centre for Strategic and International Studies in Indonesia; the Institute of Strategic and International Studies in Malaysia; the Strategic Studies Center in Thailand; the Institute of Strategic and International Studies in Myanmar; the Myanmar Development Resource Institute; the Diplomatic Academy of Vietnam; and the S. Rajaratnam School of International Studies in Singapore. Government and nongovernment experts participated in each of these workshops. Each workshop began with the three sides sharing their respective perspectives on U.S.-China relations, China-Southeast Asia relations, and U.S.-Southeast Asia relations. The workshops continued with discussion of possible options for U.S.-China collaboration in Southeast Asia. What do Southeast Asian nations want from a U.S.-China relationship in their region? What are the opportunities for U.S.-China cooperation in the region that the two nations are not currently pursuing? How do the United States and China need to adjust strategy on both sides to make pursuing those options possible? CAP and CICIR designed the workshops in each nation to gain regional input on those questions and compare views across nations. Following these workshops, the research team also convened an additional meeting in Singapore in May 2016 with representatives from all six countries that it visited to discuss the recommendations outlined in this report. What the research team heard in these joint meetings was unique, given the trilateral settings and the presence of both Chinese and U.S. participants. While there was concern that interlocutors might hold back criticism of either the United States or China in a meeting where scholars from both nations were present, the research team found that nearly all experts were exceptionally candid. Most importantly, they nearly universally saw the research team’s visit as an important opportunity to urge action on key issues of concern to them. The United States has robust bilateral ties with all 10 Southeast Asian nations, including treaty allies Thailand and the Philippines. Southeast Asia is a major element of the overall rebalance to Asia; there has been deep engagement with ASEAN-based multilateral institutions since 2009, as well as a strategic partnership with ASEAN since 2015. The U.S. private sector is heavily invested in Southeast Asia, with more than twice as much cumulative foreign direct investment as China. The Trans-Pacific Partnership is the major U.S. economic policy priority but currently only includes four ASEAN countries; the recently launched U.S.-ASEAN Connect guides economic engagement with all 10 nations. Democracy promotion is a policy priority, as is robust engagement with civil society. There are no U.S. military bases in Southeast Asia, but the United States does conduct frequent and routine military-military engagements with Southeast Asian nations, including significant rotations of troops and assets through Thailand and Singapore. China has robust ties with all 10 Southeast Asian nations, as well as a strategic partnership with the Association of Southeast Asian Nations that started in 2003. The 2010 China-ASEAN free trade agreement is the major framework for economic cooperation; China is the largest trading partner for many ASEAN member countries. Southeast Asia is a major component of the Belt and Road initiative; this dovetails with China’s long-standing support of the ASEAN North-South Economic Corridor. All 10 ASEAN countries are founding members of the Asian Infrastructure Investment Bank. Government-government relations are traditionally prioritized over engagement with civil society and other actors. There are territorial disputes in the South China Sea with four ASEAN countries; this issue looms large in China-ASEAN relations. Historically, there has been little military-military cooperation with ASEAN countries, but it is growing. Conversations in the six countries visited were varied, reflecting diverse national perspectives and priorities. However, nine themes emerged from the sum of the team’s research. One of the research team’s primary concerns prior to the initiation of this project was that it would be perceived by Southeast Asians as an attempt by the United States and China to take a G-2 approach to Southeast Asia in which the United States and China jointly determined the fate of the region. Concerns over a possible G-2 have emerged at various points in recent years, particularly during the early years of the Obama administration, with smaller countries making clear that such an arrangement is undesirable.8 However, the research team’s concerns that this project would be perceived as a G-2 approach proved unfounded. Interlocutors repeatedly expressed concerns about severe competition or even conflict between the United States and China.12 Experts in each country made clear that they do not want to see conflict between the United States and China because it would undermine the foundation of regional stability and prosperity and potentially force smaller countries to take sides.13 A Thai scholar pointed out that the major desire of ASEAN is for the “two powers to maintain peace and security.”14 Furthermore, emerging challenges such as terrorism, climate change, environmental conservation, natural disasters, poverty alleviation, human and drug trafficking, and more require their attention—not great power rivalry.15 Due to the complexity of these factors, Southeast Asian countries are generally cautious about their relations with both the United States and China, emphasizing the importance of maintaining a balance of power. Despite their focus on and concern about the likelihood that U.S.-China relations could trend toward confrontation, many also did remind the team that the United States and China should not become too close. Indeed, on numerous occasions, the team heard versions of the regional adage “when the elephants fight, the grass gets trampled; when elephants make love, the grass also gets trampled.”18 Likewise, the team was repeatedly told that Southeast Asia’s preference is for a “not-too-hot-nor-too-cold relationship” between the United States and China.19 In practice, this would amount to a functional level of strategic coordination and cooperation rather than a “coalition” or “condominium” between the two powers.20 This would include the United States and China cooperating with individual Southeast Asian countries and ASEAN as a whole to address regional challenges. Overall, despite political differences and suspicions, the common feeling among ASEAN countries is that China is still a power with which they need to and can live. Nonetheless, the research team was often told that China’s policies in the region remain “unclear and unpredictable” in the eyes of many ASEAN countries.34 A former Indonesian official pointed out that “getting the China policy down is hard. … We do not understand China, even in the simple motion of addressing and issuing communiques.”35 A Vietnamese scholar also emphasized that trust is formed from predictable behavior, which China has not displayed.36 The scholar also urged China to constantly reassure neighboring countries—not only via words but also in practice.37 Specifically, interlocutors often asked that China further explain its Belt and Road initiative, “the Community for Common Destiny between China and ASEAN,”38 and how far China’s reclamation activities in the South China Sea would go.39 Such reassurances are necessary for the ASEAN side to relieve anxiety and concerns and to ease debates among ASEAN member states. ASEAN countries take this as a sign of commitment from the United States to remain engaged with the region over the long term. A leading Indonesian scholar told the research team, “We don’t want trouble with China, but don’t want the United States to leave—the U.S. gives Southeast Asia a guarantee.”40 Several experts noted with appreciation President Barack Obama’s 10 visits to Asia since he took office in 2009 and spoke highly of his initiative to host ASEAN leaders at the Sunnylands estate in California in early 2016.41 The Young Southeast Asian Leaders Initiative was also frequently praised.42 For ASEAN countries, the U.S. rebalance is seen to be more than simply about balancing China, with shared interests between ASEAN and the United States requiring deeper ties. However, ASEAN countries did express concerns over the rebalance. Many scholars emphasized that the pivot has created “big misunderstandings.”43 A primary concern is that the rebalance could unintentionally exasperate rivalry with China, leading to instability or conflict. Southeast Asian scholars also highlighted that U.S. leaders overemphasize democracy and governance issues, and, as a Myanmar scholar noted, “Building a democracy is not instant coffee—we can’t make it in three days.”44 Scholars also looked to the history of the United States in the region, suggesting that it can be less reliable with actual assistance and investments and that the defense aspects of the rebalance are overemphasized.45 Finally, some were worried that the TPP may cause divisions in ASEAN. A former Indonesian official stated that “ASEAN is stuck in the middle between TPP and non-TPP,” since only Vietnam, Singapore, Malaysia, and Brunei are members.46 These divides threaten efforts to strengthen the ASEAN community and to maintain its centrality in regional cooperation. The Belt and Road initiative is a Chinese international engagement initiative composed of the Silk Road Economic Belt and the 21st-Century Maritime Silk Road, which connect China to more than 60 countries along these routes by land and sea, respectively. The land “belt” extends from western China through Central Asia to the Middle East and Europe; the maritime “road” routes through Southeast Asia, the Persian Gulf, and around the Horn of Africa.53 The initiative has five components: policy coordination; facilities connectivity; unimpeded trade; financial integration; and people-to-people ties. The U.S.-China relationship is highly complex, with areas of intense cooperation and competition. With media attention often focused on divisive issues, in particular the South China Sea, in Southeast Asia, regional observers were surprised to learn from the research team about the numerous tracks of cooperation under the U.S.-China Strategic and Economic Dialogue, or S&ED.67 A Malaysian scholar underscored his surprise at the success of the S&ED regarding work to combat “sea acidification, raw sea marine protected areas, and illegal fishing” but wants to extend these discussions beyond the bilateral to “benefit other countries.”68 As in this example, Southeast Asian scholars hope to translate bilateral successes into multilateral ones by building a framework that could include third parties, such as ASEAN, and exploring how the United States, China, and ASEAN could build a framework for regular dialogue. Based on the team’s findings from the trip, while there are real and serious divergent views of interests between the United States and China on some issues in Southeast Asia, the United States and China do have significant shared interests that offer opportunities for trilateral cooperation. A clear-eyed understanding of these convergent and divergent interests is necessary to chart a path forward. Supporting sustainable economic growth. Both the United States and China have significant economic investments in Southeast Asia and significant stakes in how these countries grow. Both nations therefore have strong interests in seeing that growth continue in a sustainable manner. Protecting the environment. A key part of sustaining economic growth in Southeast Asia is protecting the environment, and that means both spurring investments in cleaner sources of energy to combat climate change and protecting natural resources such as the Mekong River and fisheries in the South China Sea. Addressing transnational challenges. From pandemic diseases to the trafficking of people, drugs, and wildlife, the United States and China have shared interests in strengthening the ability of Southeast Asian nations to tackle transnational threats before they spread beyond their borders. Maritime disputes in the South China Sea. While both countries have deep interests in maintaining peace and stability in the South China Sea, divergent perspectives on other interests at stake in these disputes are driving the two sides apart and make cooperation in Southeast Asia difficult. Democracy and human rights. The United States and China have different perspectives on democracy and human rights everywhere, and Southeast Asia is no exception. Although divergent interests exist, there are many areas of agreement as well, and both nations should do more to act upon these commonalities. The next section of this report outlines ideas for turning shared interests into actionable policies the United States, China, and regional partners can all support and benefit from. In each of the six Southeast Asian countries visited, the research team solicited ideas for U.S.-China cooperation in the region that would benefit all parties. While the team assumed at the beginning of its research that avenues for cooperation would be limited, it instead found them to be abundant. Many of the recommendations heard from Southeast Asian experts were also quite practical, though a number were not. After filtering through the many ideas the team heard for practicality both in U.S. and Chinese policy settings and capabilities, CAP and the China Institutes of Contemporary International Relations propose that their two governments consider exploring the seven following areas for cooperation. To realize any of these concepts, however, three principles, which take into account the findings above, must be followed: The United States and China must respect the centrality of the Association of Southeast Asian Nations and maintain mutual respect for each other; exercise restraint in the competitive aspects of our mutual engagement in the region; and reassure the region that neither the United States nor China is interested in Southeast Asia for reasons of hegemony. Launch a U.S.-China-Southeast Asia working group on coastal resilience and sea-level rise. Officials in the United States and China and across Southeast Asia are already facing challenges associated with sea level rise, and those challenges will only increase over time as global warming continues. Coastal adaptation and resilience are an underexplored area of U.S.-China cooperation. Due to the deep common interests that the United States and China share with each other and with partners in Southeast Asia, this is an ideal area for collaboration in the very near term. At the national level, leaders across the region must incorporate future impacts from sea level rise into their economic development planning; at the subnational level, local leaders are trying out a wide array of policy approaches, ranging from infrastructure investment to coastal ecosystem restoration,75 and would benefit from exchanging lessons learned from leaders in other areas of the world. This is an entirely new challenge that the modern world has not faced before. Trading lessons learned and discovering how a particular approach applies in different environmental and economic conditions will enable all involved nations to make better policy decisions in the future. Launch a U.S.-China-Southeast Asia Coastal Cities Forum to give mayors a platform for exchanging technical expertise and best practices on subnational coastal and ocean sustainability issues. The United States and China are making good progress on subnational cooperation, particularly among mayors, and should use successful bilateral mayors’ initiatives as a model to develop subnational U.S.-China-Southeast Asia forums on issues of common concern. Since marine debris is a new focus for the U.S.-China SE&D ocean track, that would be an excellent place to start. Washington and Beijing should work with regional partners to establish a new China-U.S.-ASEAN mayors’ forum and include solid waste management and marine debris mitigation in coastal cities as a key focus area. U.S. and Chinese mayors who have already hosted successful bilateral meetings of this nature—such as the U.S.-China Climate-Smart/Low-Carbon Cities Summit—should serve as first-round hosts to help convey successful practices from existing bilateral forums to a broader multilateral context. Launch a U.S.-China-Southeast Asia maritime security forum to improve collaboration on counterterrorism; counterpiracy; illegal, unreported, and unregulated, or IUU, fishing; human trafficking and slavery; and other illegal activities at sea. The United States, China, and multiple ASEAN nations already have a history of success working to combat wildlife trafficking via Operation Cobra I, II, and III;76 separately, the United States and China also have a successful track record of working together on counterpiracy operations outside the Asia Pacific region. Working multilaterally to target illegal activities at sea is a logical next step. A new initiative or exercises should include both military-to-military and coast guard cooperation. Work collaboratively with Southeast Asian maritime nations to launch regional initiatives to survey fish stocks and conduct research on fishery sustainability. Improved domestic and regional fisheries management is a dire need for Southeast Asian nations, but they lack the technical capacity to meet this need without external support. The United States can share technical expertise and best practices; China can provide maritime resources to conduct surveys in partnership with the United States and Southeast Asian partners. For success in this area, transparency and multilateral cooperation will be critical. These initiatives should post their activities and findings in a public manner to build trust in the U.S.-China-Southeast Asian cooperation on this issue. Cooperation on fish stock sustainability could also be tied to broader cooperation on food security or food safety. For example, the United States, China, and ASEAN could engage in regional food security exercises to explore options for regional disaster relief coordination in response to potential future food security crises resulting from shocks to critical fish populations. Make ASEAN outreach a new action area under the U.S.-China Climate Change Working Group, or CCWG. The CCWG is an effective platform for exchanging climate policy knowledge and technical expertise. U.S. and Chinese experts are currently collaborating on a range of CCWG initiatives that include greenhouse gas data management, reducing heavy-duty vehicle emissions, and climate-smart forest policy.80U.S. and Chinese CCWG representatives should convene an ASEAN outreach forum to share information about the group’s activities, successes, and remaining challenges with ASEAN counterparts and present emission reduction policy lessons that may be applicable in Southeast Asian nations. Following that initial information exchange, the United States and China should launch two to three multilateral CCWG initiatives with ASEAN nations that parallel successful initiatives already underway in the bilateral CCWG. Since transport emissions are a key concern across Southeast Asia, for example, U.S.-China ASEAN initiatives could include projects on creating low-emission public transport and reducing heavy-duty vehicle emissions. Ideally, individual ASEAN nations would opt in to the CCWG initiatives that best fit their needs. Each initiative would focus on concrete joint projects, and participants would meet annually or biannually to track progress. A program of this nature should boost post-2020 climate target implementation across Southeast Asia and enable participant nations to expand climate policy ambition. Launch a U.S.-China-Southeast Asia Clean Energy Research Center, or CERC modeled on the U.S.-China CERC program. The U.S.-China CERC program brings U.S. and Chinese universities, enterprises, and research centers together for collaborative clean energy technology research, development, and deployment. It is ripe for multilateral expansion, and Southeast Asia is a natural starting point. Southeast Asian representatives are already asking their U.S. and Chinese counterparts for clean energy technology transfers; those requests came up multiple times during field research trips. Instead of handing over solutions that worked in the United States or China, U.S. and Chinese clean energy experts should work collaboratively with Southeast Asian partners to develop new technology solutions—or to adapt current solutions—to fit Southeast Asia’s unique energy technology needs. A regional CERC program could move forward as a U.S.-China-ASEAN endeavor or as trilateral programs with individual Southeast Asian nations. For example, coal consumption is on the rise in Indonesia, so that nation may be a good candidate for a trilateral CERC program on clean coal. A trilateral or multilateral CERC program should also include reverse trade missions that bring relevant Southeast Asian energy policy and business leaders to view and learn from clean energy projects and technologies in the United States and China. Launch a U.S.-China-ASEAN Low-Carbon and Resilient Cities Summit.U.S. and Chinese mayors and provincial and state leaders recently attended the second U.S.-China Climate-Smart/Low-Carbon Cities Summit to exchange ideas and learn from one another’s experiences on emission reduction and low-carbon economic growth. The subnational leaders who attended the first summit in 2015 and the second summit in 2016 report that the exchanges were extremely useful for finding out how subnational leaders are addressing common challenges across a range of circumstances. This program should be expanded to include a U.S.-China-ASEAN Low-Carbon and Resilient Cities Summit. The resilient aspects of this summit should cover urban planning and resilience, which are of particular interest for all countries in the region but currently underrepresented in the U.S.-China bilateral relationship. The summit could support best-practice sharing to build resilient and equitable communities by, for example, highlighting strategies to build low-carbon and resilient infrastructure and buildings that reduce the costs, damages, and public health and safety risks of more frequent and intense rainstorms, floods, heat waves, and other climate change effects. The low-carbon agenda should include long-term low-carbon economic planning, which is currently underway in both the United States and China but lagging across Southeast Asia. Leverage the U.S.-China Green Ports and Vessels Initiative to help Southeast Asian nations establish standards and best practices for greening ports across the region. The United States and China recently launched a Green Ports and Vessels Initiative that aims to reduce greenhouse gas emissions from ports and vessels. Under this new initiative, environment and transport officials are working together to exchange best practices and improve emission control regulations at ports in both nations.81 Greenhouse gas emissions from ships in port are expected to increase around 40 percent by 2030, so near-term action is critical.82 Many of the vessels in Chinese ports stop in Southeast Asia as well. Coordinating emission control policy across the region will maximize the benefits from the existing initiative and, since the United States and China are already moving forward, provide Southeast Asian nations with policy expertise and the technical assistance needed to implement new emission control programs. Launch a special economic zone for palm oil development in Indonesia. Palm oil deforestation is a particular concern in Indonesia, where tropical peatland forests—which are valuable carbon sinks—are being cleared for palm oil development. Indonesian forestry experts report that new forests are being cleared despite the fact that existing cleared land is already available.83 China is the nation’s second largest export market for palm oil, behind India.84 Indonesia could establish Climate-Smart Palm Oil Development Zones in land that has already been cleared; China could issue import tax rebates or other policies to encourage Chinese buyers to source palm oil from these zones instead of purchasing palm oil cultivated on newly cleared land. A development zone of this nature could be an ideal feature project for China’s Belt and Road initiative. The United States and China are already cooperating on forestry issues under the CCWG, including on how to account for forestry policy actions under the U.N. Framework Convention on Climate Change. The CCWG could support the palm oil development zones by providing technical assistance on policy implementation and accounting under the framework convention. Southeast Asia is becoming a top investment destination. Rising economic growth is drawing investors from around the world: In a recent survey of global companies with more than $1 billion in annual revenue, 60 percent named Southeast Asia as their top overseas investment destination.85 This new capital influx brings economic opportunity, but it also brings new risks. Many Southeast Asian nations do not currently have good environmental regulatory standards in place to steer investors toward projects that will be sustainable over the longer term, such as energy projects that support a nation’s climate goals and factories that use the latest pollution control technologies. Weak standards create a risk that investors will pour capital into projects that eventually do more harm than good. The United States and China should work collaboratively to help Southeast Asian nations guide inbound investments—including investments from the United States and China—toward sustainable projects that support economic growth while minimalizing negative environment and climate impacts. The United States and China should work with ASEAN to develop common guidelines for infrastructure investments in the region. The United States and China can share technical expertise to help Southeast Asian counterparts strengthen regulatory standards. Bilaterally, the United States and China have already pledged to make sure that “their bilateral investments in other countries should support low-carbon technologies and climate resilience.”86 Southeast Asia is a logical test bed for action on this issue. The United States and China should work with ASEAN to identify funding sources for sustainability improvements. During the team’s field research, experts across the region stated that funding is a major stumbling block in sustainability planning. Local officials report that they would like to hold projects to a higher standard but they fear doing so would increase the costs beyond their ability to pay. This is a legitimate problem and one that the United States and China should work to address. If Southeast Asian nations are willing to improve project sustainability standards, the United States and China should work with those nations and the international development banks to identify options for lowering the costs for more sustainable projects and/or providing funding support to make it possible for local officials to choose more sustainable projects. Currently, the United States and China both run people-to-people exchanges with each other and with Southeast Asian nations, but those exchanges occur along separate tracks. On the U.S. side, two extremely successful U.S. initiatives to deepen people-to-people ties with Asia are the 100,000 Strong initiative with China and the Young Southeast Asian Leaders Initiative. Each of these programs is helping introduce thousands of next-generation leaders to one another, but there is no regional integration among programs: Americans who study Chinese in China under the 100,000 Strong initiative do not visit other Asian nations to help ground their U.S.-China experiences in a broader regional context. Similarly, China runs U.S.-China bilateral exchanges through one channel and outreach to Southeast Asia through another—for example, via the Belt and Road initiative for people-to-people exchange. Using these existing programs as the foundation, the United States and China should work together to form a scholarship program focused on Southeast Asia. One way this could be achieved would be for ASEAN students to do a joint study program that involves time spent in both China and the United States. Ideally, this scholarship program would encourage participants to design their own program of study, choose their own host institutions, and freely engage with a wide array of institutions and individuals in the United States and China. Such a program would aim to demonstrate that the United States and China are not simply courting Southeast Asia for their own parochial interest but, rather, that they believe that all involved would benefit from closer trilateral ties. Developing greater connectivity is a top priority for all ASEAN countries, and the needs are vast. This is one reason why China’s Belt and Road initiative is so appealing to ASEAN nations. As ASEAN connectivity and integration is also clearly in the U.S. interest, the United States should actively seek to partner with China’s Belt and Road initiative in Southeast Asia. U.S.-China cooperation on finance, poverty reduction, water resources protection, and cultural heritage protection should be top priorities for such cooperation. While the United States and China have different approaches toward physical infrastructure assistance projects, these projects remain potent symbols of a country’s commitment to regional development. As such, the United States and China should work together on a landmark project to demonstrate that they are interested in and capable of working together to assist in the region’s development. The United States and China should consider joining forces for a high-profile connectivity project with historical significance. One concept with high levels of symbolism would be to rebuild the Stilwell Road in Myanmar, which was the site of China-U.S. cooperation during World War II.88 If situated appropriately in ASEAN’s connectivity plans, it would not only combine modernization with honoring shared history, stimulating local economies along the road, but also set a good example for cooperation to achieve ASEAN connectivity. One major takeaway from the CAP-CICIR research trip is that the United States and China need more of this type of experience: together engaging with third parties in Southeast Asia. The model of this trip pushed experts from the two countries to try to understand each other better and, in the process, produced valuable insights about U.S.-China relations in the region. In order to move past simple bilateral interactions at all levels of engagement, the United States and China need to implement more organized programs along this model, including at the Track 1 level. Support platforms that enable U.S.-China-ASEAN exchanges among Track 2 experts and communicate their findings to the official track. Many of the counterparts with whom the research team engaged across the region suggested the best formula would be “ASEAN+2”—first on the Track 2 level, or unofficial track, and then Track 1, or official track, with ASEAN serving as a convener. As such, an annual China-U.S.-ASEAN Think Tank Forum should be established, tied to an existing ASEAN-led multilateral meeting at the official level. These meetings would provide opportunities to review cooperative areas of U.S.-China, U.S.-ASEAN, and China-ASEAN relations to make sure that opportunities are not missed to expand bilateral cooperation into trilateral cooperation. Ideally, dialogue participants should not be solely strategic- or security-focused experts; rather, this trilateral dialogue would also aim to include experts from different practical fields—climate, energy, law, education, health care, and urban design—who can demonstrate creative ways of engaging and cooperating with their counterparts. Leverage trilateral forums to evaluate progress on U.S.-China-ASEAN cooperation and to identify existing ASEAN initiatives that have already been agreed upon that could use the energy and resources of the United States and China to achieve their potential. One example of such an initiative, unearthed during the research team’s visit to Singapore, is the ASEAN Agreement on Transboundary Haze Pollution.89 Experts at the meeting convened in Singapore suggested that the United States and China have particular expertise to offer on this issue and would therefore be good ASEAN partners on that endeavor. The primary mechanisms for engagement between the governments of the United States, China, and Southeast Asia are the ASEAN institutions, such as the East Asia Summit, the ASEAN Regional Forum, and the ASEAN Defense Ministers’ Meeting Plus. Every year, there is a wide range of cooperative initiatives across these institutions, which are prime opportunities for the United States, China, and Southeast Asian nations to work together. In the maritime realm, the United States and China could work with ASEAN nations to expand the existing Code for Unplanned Encounters at Sea, or CUES, agreement90 to include coast guards and leverage ASEAN forums to do more workshops and trainings on ways to prevent and manage incidents at sea. More broadly, the United States, China, and ASEAN countries—along with the other members of these ASEAN-based institutions—should identify key shared challenges where cooperation in Southeast Asia would be particularly useful and use the ASEAN institutions as a way to forge agreement and spur action. While the research findings of this report conclude that Southeast Asian countries seek U.S.-China cooperation in the region, the reality is that U.S. and Chinese officials currently consider the possibility of robust cooperation to be unlikely in the near term due to tensions surrounding the South China Sea. This is misguided, however, as the South China Sea is only one of many high-priority issues for Southeast Asian countries, and both China and the United States can build trust and confidence with the region by working toward common aims whenever possible. Much like in the U.S.-China bilateral context, it is possible to forge cooperation based on mutual interest despite major tensions in the overall relationship. For practical U.S.-China cooperation with Southeast Asian nations to be realized, small but important changes will have to take place in how the United States and China view Southeast Asia and how the two nation’s respective bureaucracies formulate policy in the region. First, the United States and China must subtly change how they view the other’s activities in the region and recognize that their respective interests are not zero sum. They should acknowledge that Southeast Asia’s success depends on strong relationships with both the United States and China, and one nation should not instinctively demonize the engagement of the other. Given frequent U.S. and Chinese official statements that the region’s success is important to both the United States and China, by extension, one nation should support the other’s activities if it can bring legitimate gains to Southeast Asia. With recognition that the other’s engagement in the region can benefit all involved, U.S. and Chinese leaders should make clear that U.S.-China cooperation—or at least coordination—on Southeast Asian priorities is important. While ASEAN countries should help guide the United States and China toward priority areas for cooperation, as outlined above, Washington and Beijing should make clear that, fundamentally, cooperation is possible and beneficial. The current tendency of U.S. and Chinese officials to instead view Southeast Asia as a venue for U.S.-China competition serves no purpose and alienates the very countries with which the United States and China seek to build strong relations. Second, greater communication within the U.S. and Chinese governments between U.S.-China bilateral relationship managers and Southeast Asian policymakers is necessary to realize practical cooperation. Right now, these specialists are working in separate stovepipes, with bilateral managers relatively unaware of developments in Southeast Asia and officials focused on Southeast Asia generally unfamiliar with constructive tracks in U.S.-China relations. This situation is even more pronounced in China than in the United States, as there is even less bureaucratic linkage between U.S. and Southeast Asia-focused scholars and policymakers. At least for the United States, both relevant groups are focused on Asia and are generally part of the Asia-wide bureaus. The power of mixing these groups of specialists was apparent to our research team over the course of this project. The intensive mingling of U.S. and Chinese experts in U.S.-China relations and U.S. and Chinese experts on Southeast Asia provided opportunities for sharing information and connecting priorities in truly groundbreaking ways. More interaction among these diverse actors—such as through an ASEAN+2 Think Tank Forum—would likely allow more areas of common interest to surface. Vikram Singh, Vice President for National Security and International Policy at the Center for American Progress, and YUAN Peng, vice president of the China Institutes for Contemporary International Relations, served as the U.S. and Chinese co-directors of this project. Melanie Hart, Senior Fellow and Director of China Policy at the Center, and Brian Harding, Director for East and Southeast Asia at the Center, served as lead report authors on the U.S. side. ZHANG Xuegang, CICIR director for Southeast Asia; CHEN Wenxin, CICIR deputy director for American Studies; and ZHANG Fan, CICIR researcher, served as lead report authors on the Chinese side. The authors would like to thank Liu Bo, Luo Yongkun, Yang Wenjing, Blaine Johnson, Shiva Polefka, Michael Fuchs, Stefanie Merchant, and Aarthi Gunasekaran for their invaluable contributions to the CAP-CICIR research project.